The marcescent leaves of these young American beech trees won't be around too much longer. This morning I saw the first northbound skein of Canada geese, a long line of about 150 birds, far more than the 30-couple that are resident here on Roundtop. The lone male red-winged blackbird has now been joined by several fellows. The boys are settling on territory, arriving earlier than the females, who will decide later which of these singers with red chevrons on their wings has the best spot to build their nests. 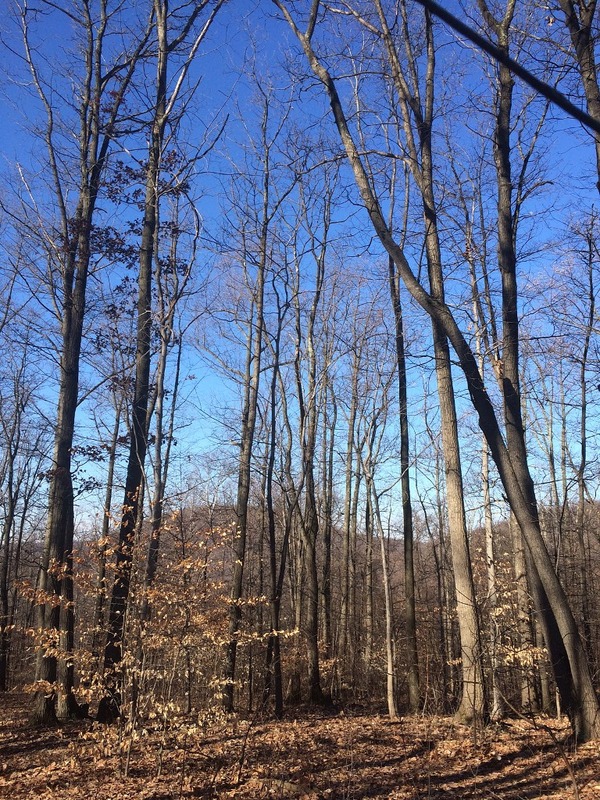 With the disappearance of the snow cover, I can once again walk through the forest around Roundtop. In much of winter I am restricted to plowed roads and pathways. Even once the snow melts, I avoid the worst of the mud. I own “Wellies,” which are great at keeping out the mud but not designed for long walks. Last night saw a mild freeze, which froze the mud long enough for me to take an early morning walk. Tomorrow a bit more snow is called for, which means today is the calm before the storm, and a beautiful, calm morning it is—ideal for a walk in the woods. Woodpeckers were busy; a pair of mallards were complaining about something, the bluebirds were singing. Between them and the blackbirds, the songs nearly qualified as a dawn chorus, a harbinger of spring if ever there was one. Nice winter woodland image, Carolyn. That photo is evocative. Makes me wish I was in the forest right now.